Stamford Talk: Eat, Think, Drive, Blog! : Margot's Offers Non-Starbucks Coffee! SCOOP: A very good café/wine bar just opened in the Bull’s Head Strip Mall. 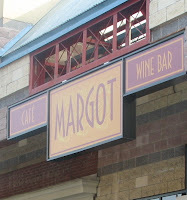 MY TAKE: I thought Margot was a chain because the sign is polished and generic, but it’s the new place from Margot Olshan. She runs the SoNo Baking Co. and Cafe, one of the few good things about Norwalk. Margot Café and Wine Bar in Stamford has pastries, coffee, breakfast, and a small but nice lunch menu. For the same 7-11 $ you pay for a crappy lunch at Black Bear, you’ll get healthier, better food. Margot has an affordable but high-quality wine list, hand-chosen by the manager. We had a rich Spanish red for 12 $ and a delicious cheese plate that had way bigger portions than Saltwater Grille. (We also didn’t have to flag down a harried waiter who treated us like idiots for wanting more bread- get over yourself, SWG.) Margot’s bread is excellent and makes the cheese plate almost enough dinner for two people (make that two women). One trick: Margot doesn’t serve dinner yet. They close 6ish, so get there by 4:30 to have plenty of time to chat and drink in a sunny, relaxing place. SUDDEN REALIZATION: Oh my god, we have a place to go for coffee during the day besides Starbucks. Let’s support our local small-businesses. EXTRA INFO: I just found an impressive entry about Margot on PBS Everyday Food at http://www.pbs.org/everydayfood/cast/margot.html.